Published Bestsellers: Ireland tour book with a visit to the (Patrick) Brontë country. A Brontë Blog feature. Ireland tour book with a visit to the (Patrick) Brontë country. A Brontë Blog feature. 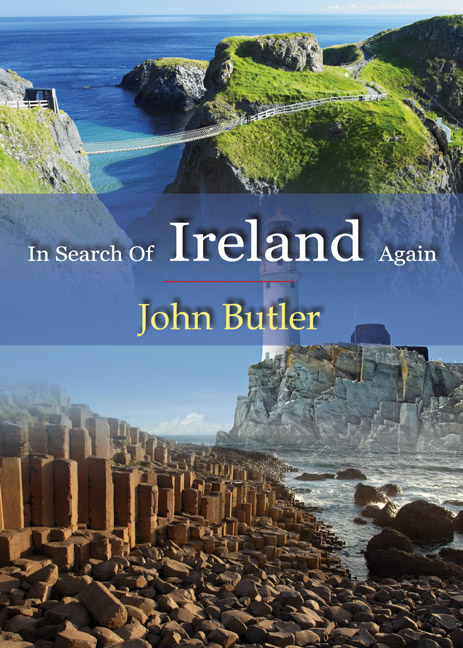 Author of 'In Search Of Ireland Again', John Butler talks about his new book. "I first visited Ireland in 1947 – inspired by that King of travel writers, H.V.Morton and his ‘In Search of Ireland’. In numerous visits since, I have been struck by the changing face of the country, splintered by the formation of the six counties to become part of the UK. I am bewitched by the sheer beauty of Glengariff, see Cushenden and I’m reminded of Clough Elliss and Port Merion. See Donegal – now and in H.V.Morton’s time. Visit Knock and its commercialism. Visit Cong where the film’ The Quiet Man’ lives on. Attend Mass in Galway. Visit the Claddagh. Cobh – the saddest place in Ireland. Here the great liners waited for the emigrants – the haemorrhaging of her best and youngest blood. I kiss the Blarney Stone, discover drisheen, visit Mount Melleray, tour Brontë land. Take the rocky road to Dublin. Inform a lady in Drogheda that Cromwell is dead. Dublin and St Michans, shake hands with a Crusader, search for Uncle Barney, visit Guinness Brewery- the GPO and 1916 uprising – back to Larne and home."